2 Tudor City Place offers you the best of all possible worlds. Located in a quiet midtown cul-de-sac, the residence is just steps away from two tranquil parks. Nearby are essential services, restaurants, transportation, offices, entertainment and world-renowned sights. Enter our building by an imposing central lobby and you'll find over 300 spacious, attractive apartments situated in two extended towers. The apartments include studios and one-, two- and three-bedroom homes. Some feature terraces and many look out onto city, park and river views. Residents of 2 Tudor City Place enjoy amenities shared by the city's most exclusive properties. Our full-service building provides 24/7 doorman service, on-site indoor parking, storage and laundry facilities, and handsomely landscaped central courtyard and exterior gardens. For more information about living here, see Sales and Rental information. 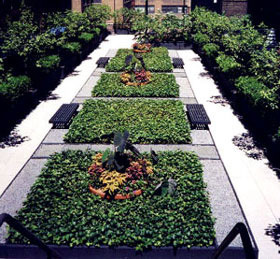 2 Tudor City Place courtyard garden.